ENVIABLY SITUATED IN A SMALL PRIVATE CUL DE SAC WITH GARDENS BACKING ONTO A PLAYING FIELD, THIS LOVELY DETACHED FAMILY HOUSE PROVIDES a generous reception hall, 30' plus kitchen/family room, sitting room, dining room, study, utility room, cloakroom. On the first floor a large galleried landing leads to the lovely main bedroom suite with dressing room/bedroom five and en suite, two further bathrooms and three further bedrooms providing four/five bedrooms overall. The property is set in southerly aspect gardens that back towards the village centre and the Parish Church of St Mary's. There is also ample off street parking and detached double garage. A Rare Oportunity.. - With planning consent to extend to both the front and rear this unfinished project when concluded will provide a stunning family home of substantial proportions. The property already benefits from some internal alterations and remodelling, the style of which can either be continued or altered to suit individual needs and taste. The accommodation presently being offered comprises; generous reception hall, 30' plus kitchen/family room, sitting room, dining room, study, utility room, cloakroom and to the first floor galleried landing, large main bedroom suite with dressing room/bedroom five and en suite, two further bathrooms and three further bedrooms providing four/five bedrooms overall. Location: - The village of Standon has local amenities including quaint village pubs, a village hall, and a choice of traditional shops: butcher, baker, post office, general village store and hairdresser. Access to the Rib Valley is close to hand that provides access to a number of footpaths and bridleways. Private and state education is well catered for with schools in the neighbouring village of Puckeridge as well as St Edmunds college being just a few minutes driving distance. Access to the A120 and the A10 bypass is close to hand which subsequently leads to the neighbouring towns of Bishops Stortford, Ware and Hertford. Sitting Room: - 12'7 x 14'5 (3.84m x 4.39m) - Formally the drawing room. Dining Room: - 19'10 x 13'10 (6.05m x 4.22m) - Formally the children's den. 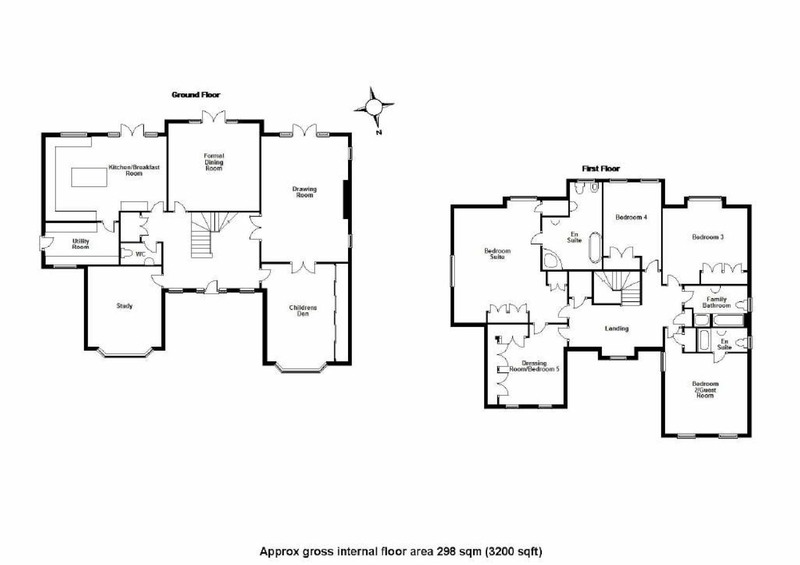 Kitchen/Family Room: - Approx 36'0 x 15'7 (Appro x 10.97m x 4.75m) - AGENTS NOTE: the wall between the kitchen/breakfast room and the formal dining room has been removed. Outside: - The property is approached by a generous sweeping gravel driveway providing parking for several vehicles that leads to a detached double garage with remote control electric doors. To the rear there is a garden that enjoys a southerly aspect with views towards Standon village centre and St Marys church. The garden has a full width terrace that leads onto lawn with flower beds and borders. Central York stone pathway leads to gated access to neighbouring Burrs meadow. Within the garden there is an attractive terraced area that is retained by red brick walls. There is also side access, external lighting, outside water point and log store, plus three electric remote control sun shade awnings fitted to the rear of the property. Epc: - EPC Rating D.